Last year I surveyed university faculty who teach field-based academic courses (i.e. geology, archeology, ecology) and learned that 64% of them felt that their university provided inadequate risk management support and training for field courses. When I talked to the directors of non-profit adult education programs, many of them felt the same way. When I asked why, they described a lack of time and resources. They also said that their leadership operated in a reactive rather than proactive manner and wouldn’t enhance risk management training until they experienced a major incident. Most of the people that I talked to felt guilty about taking students into the field without adequate training or support, so I started to map out a solution. 4) regularly review the course to see how well you managed risk. Allow me to illustrate the risk management cycle using a recent example. The Environmental Science of the San Juan is comprised of weekly lectures throughout the spring semester and a four-day river trip on the San Juan River in southeastern Utah. This spring my students learned about the San Juan watershed and designed simple environmental research experiments during the semester, so my primary goals for the trip were to allow the students to get excited about field research and facilitate personal growth. When I think through the risks on a course, I like to think through three types of hazards: people, activities, environment. People can create a hazard if they make poor decisions in the field, have medical issues, or if they can’t complete the course activities in the way you planned. I was lucky that my San Juan River students were mature - mostly college juniors and seniors - and relatively fit. There were two students who appeared to be active recreational drug users but the other students seemed clean and were invested in the class. I asked the students if they had allergies/medical concerns (they didn’t) and knew how to swim (they did). After talking with my students, I felt like I had a good sense of the human hazards and my concerns centered on students who might use controlled substances during the trip. Next, I looked at the activities that we’d undertake in the field. The students would be riding in oar boats that were rowed by paid guides and also paddling small inflatable kayaks. The section of river that we floated traverses several sections of Class II-III whitewater. In addition to traveling in boats, one of the research groups planned to collect aquatic insects by wading into the stream and kicking sand into a net. Although people typically use kick nets in very shallow water, the current had the potential to tip a student over during the work. Last, I looked at the environmental hazards. The river itself poses a hazard to anyone swimming or boating. Most of the San Juan has a relatively sandy bottom, but there is potential for foot entrapment in the rocky rapids. There are also snags - upturned trees stuck in the sandy bottom of the river - and sharp and thorny trees that hang over the river’s edge, which can cause a boat to tip if the navigator isn’t paying attention. The desert environment poses hazards such as spiny plants and venomous animals. In addition, while the weather in mid-April is typically warm and dry, this region is quite variable so the potential risk of extreme heat or cold was also a concern. Let me summarize the most significant risks that I identified when I was planning for the field section of this course: potentially altered students, fast-moving water, typical desert hazards, and variable weather. The next step in the process is to assess the risks to ensure that they are justified by the course learning outcomes. My course goals were to teach students about environmental history, geology, ecology, and archeology so they could better make environmental management decisions. 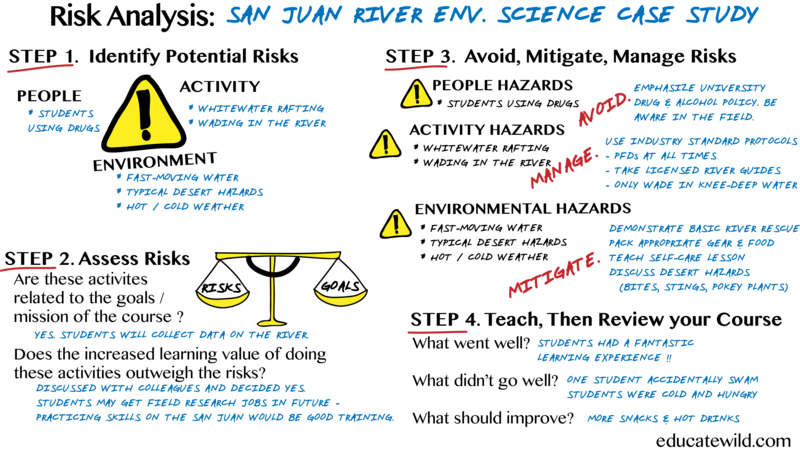 I chose the San Juan River as a case study because of the interesting environmental interactions there and it is also a beautiful place. Notice that whitewater rafting and desert camping were not skills that I intended to teach my students, so fast moving water and “typical desert hazards” were ancillary risks on this course. In the southwestern USA it is difficult to go into the field without facing “typical desert hazards”, so my students are relatively accustomed to dealing with those risks. I assessed the relative risks on the river trip against the course learning outcomes. One of my course goals was to make the students better environmental managers and teaching the course on the river added a dimension of realism that would be difficult to reproduce off the river. The students would learn how to work in the field, pack and move field equipment on boats, live and work in a research community, and gain some exposure to river travel, which may be useful if they were to get a river-related job with one of the agencies near us. I talked about the river risks – exposure to fast moving water, possible immersion in cold water, potential for foot entrapment – with my colleagues who had spent time on personal and scientific river trips. We concluded that as long as the river risks were managed using industry standard practices, that the learning value of being on the river outweighed the risks. Once I decided that the risks were worthwhile for this course, I disclosed the risks – using the raft guiding company’s standard waiver and my syllabus – to students prior to enrollment. I also offered to answer any questions that they had about the course, river trip, or schedule before the semester began. This process allowed my students to acknowledge and accept the risks associated with the river trip hereby giving informed consent. Once you know the hazards that you will face in the field, you have three choices for how to handle them: avoid, mitigate or manage. I hoped to avoid the issue of students using drugs and alcohol on the San Juan River altogether. The university prohibits the use of controlled substances on campus, their transport in university vehicles, and the guiding company prohibits their use in the field. I emphasized this in my syllabus and in lecture. I told students that they should not expect to pass the class if they were found using drugs or alcohol on the trip. My colleagues and I have been teaching our environmental science students to mitigate “typical desert hazards” throughout their undergraduate career. We regularly talk to them about proper self-care (i.e. sun protection, hydration, nutrition) and describe the venomous animals that live in our region. In addition, I taught a very short first aid lesson to my students during the semester so they would know how to handle bites, stings, and spiny plants. The river guides also repeated this information when we encountered specific hazards in the field. The risk of fast-moving water was managed using industry standard methods such as wearing personal floatation devices (PFDs) on the water, teaching participants to receive a throw rope for rescue, and providing basic river navigation skills. Experts generally recommend that instructors facilitate activities in the field that are well within their comfort zone so they have the experience to respond to unexpected events. Thinking through your course activities and detailing strategies to avoid, mitigate, or manage hazards allows you to reduce the chances of an incident and mentally prepare for unforeseen events in the field. The next step in this process is to teach your course. After you return from teaching, you should review your risk management strategy, protocols, and field experience. The San Juan River trip went pretty well this year as we only had two issues – near hypothermia conditions throughout our trip and a student who accidentally swam in the cold river. The students were dressed warmly enough during the trip, but they didn’t get quite enough to eat given the conditions. When I returned from the field, I revised my packing list to suggest slightly warmer clothing and met with the guiding company to recommend more hot drinks, soups, and calories on future trips. I concluded that I couldn’t have done much more to prevent the accident that caused the student to swim. She was brushed out of an inflatable kayak by a low-hanging tree when she and her kayaking partner veered out of the main current. She had been taught what to do if she fell into the water and was quickly rescued and back in her boat. Given the cold, rainy weather, I wish that we had gotten her into dry clothes more quickly than we did, but when I asked her about her swim at the end of the trip she reported that she felt well taken care of throughout the experience. Over the past seven years of teaching this course, the annual risk management review has resulted in some key improvements, such as the first aid lessons, better risk disclosure to students, and more communication with the guiding company. I have found that this four-step risk management process allows my colleagues and I to identify hazards before we take our students into the field, discuss how we’ll manage those hazards, as well as determine which risks are worthwhile given our learning outcomes. If you are interested in learning more about how to apply this risk management system to your field courses, you can enroll in RM101: Intro to Risk Management, which is a 75-minute online course that uses whiteboard animation videos, quizzes, and case studies to improve your risk management awareness. You can enroll for a 50% discount using this coupon: 50-OUTDOORED at educate-wild.teachable.com. Dr. Angie Moline is the founder of Educate Wild! 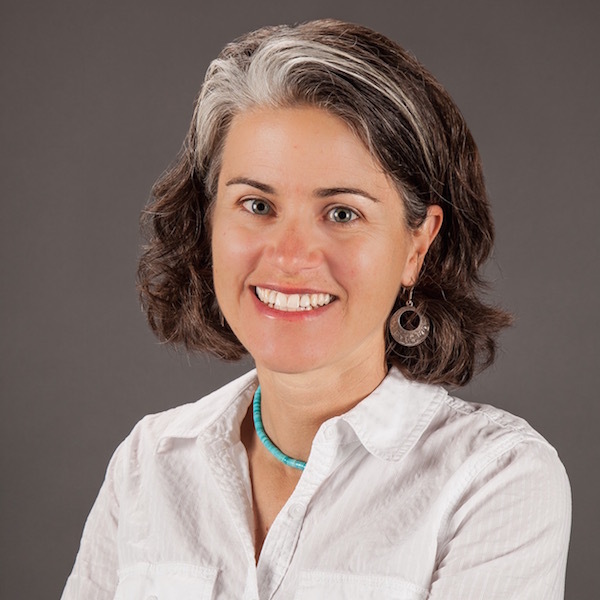 She has served as the Assistant Director of Education for the Landscape Conservation Initiative and a Senior Lecturer in Environmental Science at Northern Arizona University. Angie has taught field-based courses across the western USA and Mexico for Northern Arizona University, the Wild Rockies Field Institute, Prescott College, and Outward Bound. She is the former director of the Doris Duke Conservation Scholars Program @ NAU, the Grand Canyon Semester @ NAU, and the Summer Conservation Experience. She holds a doctorate in ecology from Colorado State University where she served as a National Science Foundation GK-12 fellow for several years.